Laura Thompson is a mother, a wife, an artist and she teaches art at Thomas Harrison Middle School. For those of you familiar with the middle school species, that translates to: Laura has the patience of a saint. I recently visited an art exhibit of student work that Laura organized at the Blue Nile in downtown Harrisonburg. The show consisted of hand-sewn monsters that represented the student’s secrets, inner demons and fears. The artwork was impressive enough on it’s own, but to read the words of a middle schooler explaining that part of themselves was downright powerful. The world needs more teachers like this woman. We’re thrilled that she is dedicating a chunk of her precious time to participate in Art Lotto again this year. Laura will be creating a portrait of Greg Sultan. Laura’s portrait will be created by Sharon Skates. 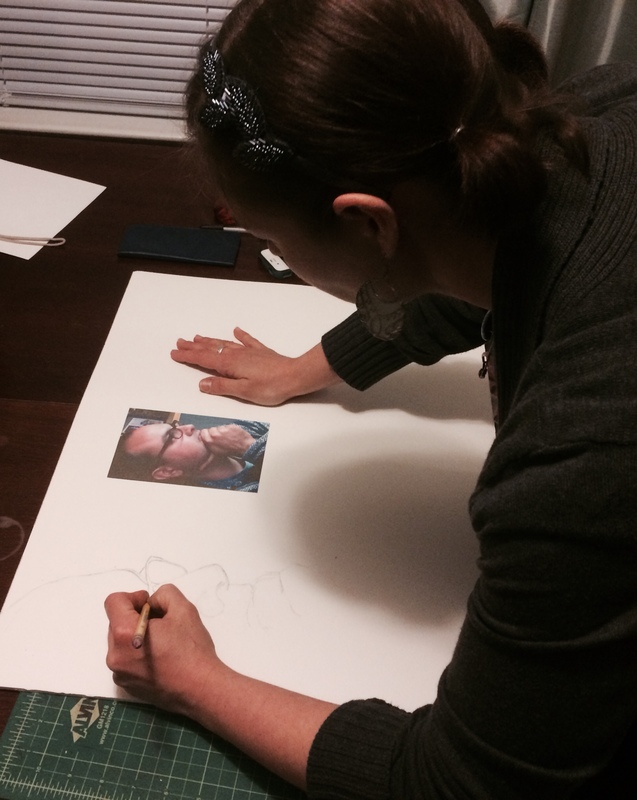 Laura works on a sketch of her Art Lotto partner, Greg Sultan. “I love that the Art Lotto process can be so organic. Like last year, I came to the meeting with no plan, no expectations, and an open mind. When I met Greg Sultan at the Baja Bean in Staunton, I didn’t really know what to expect. I had talked to him briefly at the Luck of the Draw, and had looked at his website, but had no idea what form his portrait would ultimately take. I am an art teacher, so I know a wide range of media. At first I thought maybe glass, then maybe wood block printing, then maybe watercolor. I still haven’t landed on one for sure.